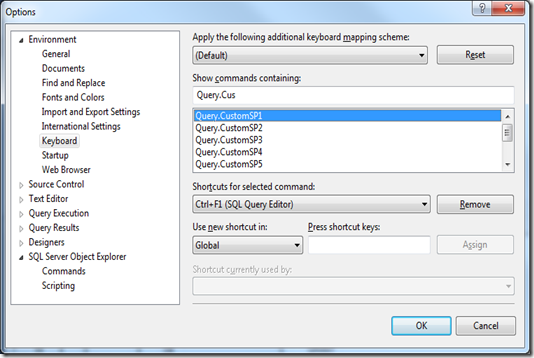 Another new feature of the new SSMS Denali is introduction of the new Keyboard Shortcuts Manager known from the Visual Studio, as the new version of SSMS is based on the VS 2010 shell and is more bound to the VS shell than any previous version. 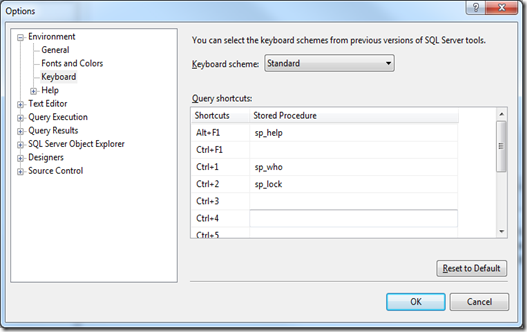 If you get used for shortcuts in some 3rd party SQL Server management application, now you can configure the SSMS to use your own shortcuts. For example if you are missing a default shortcut Ctrl+Shift+M for “Specify Values for Template Parameters” from previous version of SSMS and which was not set-up after my installation of SSMS Denali, you can use the shortcuts manager and assign it. 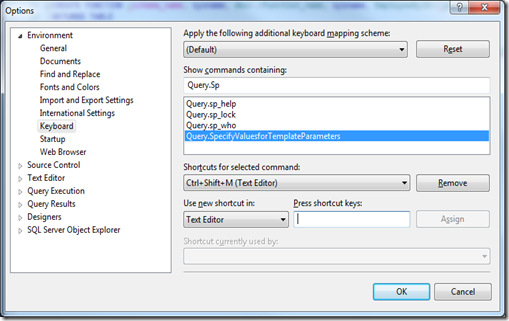 But When you take a look on the keyboard shortcuts in the SSMS Denali, you will find shortcuts for the Custom Queries, although I didn’t find a way how to define the custom queries. So hope, that Microsoft will add a GUI into the options dialog for defining such queries in upcoming releases of the Denali. On the first screenshot here you can see, that there are also separate commands and shortcuts for the sp_help, sp_who and sp_lock procedures.